It is normally left to maintenance personnel to monitor and check for overheating problems in control cabinets. The High Temperature Warning Sticker provides a more easy,reliable, and low cost qualitative monitoring of the temperature inside of electrical and electronic control panels. 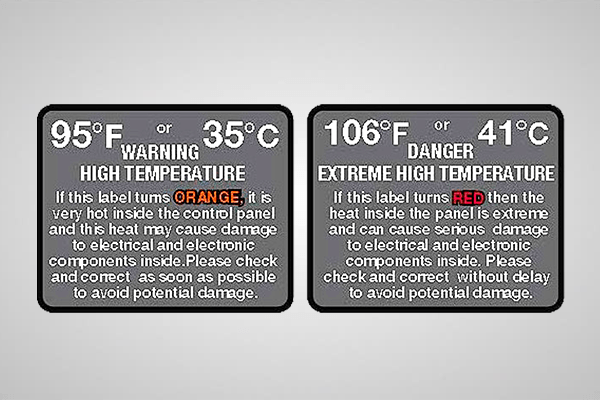 Since high temperature inside a control panel can be damaging to internal equipment and lead to unplanned shutdown of factory operations, the label provides for an effective warning with a color change indicator to ORANGE and a danger warning with a color change indicator to RED. The color change on the High Temperature Warning Sticker is reversible so when the temperature problem is corrected, the label color goes back to black and can continue to be used indefinitely. While it is a qualitative measurement only, it provides an ideal cautionary monitoring of possible temperature problems within a control panel.